Papion “James Youngson” was born and educated in the North East of England, and is one of the most sought after artist in the U.K. he started sketching and drawing as a child. 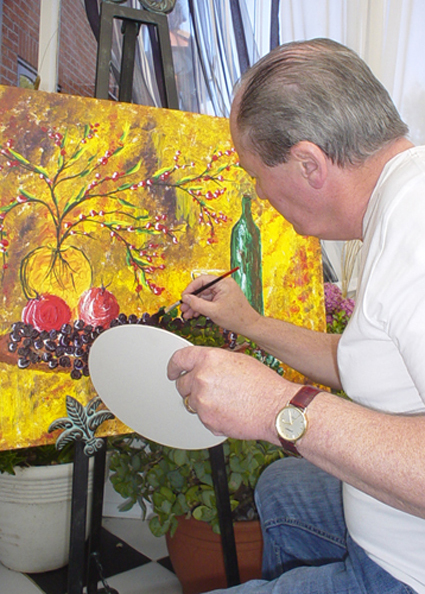 He worked on his own, experimenting in various media and with different techniques. Though he never had any formal education in the arts, he drew inspiration from travel in France and Europe, and from the artists that he met. His paintings are always serious in feeling, and it is impossible to resist their force and beauty. He is a master in many areas; and the fact that he has been producing over many years and has been very favourably recognized in England and Scotland as well as Overseas is no small measure of his success. Papion has a reputation for bringing imagination and originality to both the traditional and abstract. Papion hopes you enjoy looking through his portfolio, and hopes that you will find something with that “must have” appeal that you can treasure and keep forever.